Look no further for discounts on the MassageTableRentals & MassageSupplier website - including holiday and special promotions! LIke us on Facebook or Twitter for up to the minute information, and special sale codes only available to those that like us on Facebook, and follow us on Twitter! Save 10% on any retail item in our store with this discount code, good through December 31, 2013! Save 12% on Spa And Stationary tables now through Dec 24, 2013 - Happy Holidays to your hands, back, feet - ahh the relief of the right support! Good on any stationary, lift, or hydraulic table. 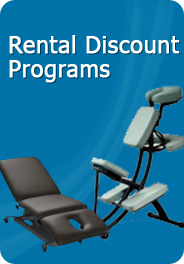 Posted on Facebook by MassageTableRentals.com.